Join CIty Repair at Arte Soleil, a local handmade gift shop and gathering space to celebrate the arts, relationships and community. As a #Placemaking site #VBC19 (May 31st thru June 9th), we are getting some foundation work started now in the future garden space by sheet mulching. Join us Sunday, April 21st from 10am-4pm! Potluck lunch and snacks. Rain or shine! Hope to see you there! The Oregon Public House has partnered with the City Repair Project through their Charity of the Day program to offer free activities and mini-workshops from 12-6pm and live music from 6-9pm on Earth Day, April 22. A portion of all food and beverage sales will benefit City Repair and their annual placemaking event, the Village Building Convergence. Come for lunch or dinner or for specific offerings from our soon-posted schedule. Let us know you’re coming (and invite your friends) on our Earth Day FB event page. The venue is family-friendly and daytime activities will have offerings for children. Coloring contest winners in 2 age categories will earn a cob-oven pizza party for 6 friends at Jean’s Farm. We’ll have a Sidewalk Plant Sale. Free plants will also be offered. The evening will be highlighted by a full set from Galen Hefferman (6pm), Flying Caravan (7pm) and Owl Antique (8pm). We heard a rumor that Flying Caravan will perform a first-ever all-strings line-up featuring a new cellist in the group (fingers crossed it’s true!) And Owl Antique, led by Trent Price, promises to get your bum shaking. The Oregon Public House is located at 700 NE Dekum Street. The first non-profit pub in the U.S., OPH highlights Portland-area charities to receive a portion of proceeds and to date has raised $97,000 for these causes. City Repair was a good fit for the Charity of the Day that coincided with Earth Day, and plans to work some placemaking magic to make the already-beautiful pub into an even warmer and more vibrant community space. Come by for just a pint, a workshop, lunch or dinner with the family, music out with friends, or all of these, and leave having supported an a non-profit approaching 23 years of dedicated service to the Portland community to bring accessibility and practicality to treating every day like Earth Day! And don’t forget to mark your calendars for the 2019 Village Building Convergence, happening all across Portland from May 31-June 9. This year’s placemaking projects will include around 15 Intersection Paintings and many opportunities to learn natural building and ecological landscaping methods. The project link will be posted here when it is available. Check out FB Event Page for the VBC. Our bi-weekly general assembly at the Rebuilding Center conference room. All are welcome - join us as we work to strengthen and build the network of villages for houseless people in the Portland area! Pizza for lunch will be provided. Plant Swap and Potting Party! Join City Repair's #Permaculture team as we share the abundance of our plants with one-another and community sites we serve! If you have any extra starts, from veggies to herbs to natives, bring them on over! The garden site is a nursery and storage site for plants that will be used for the Village Building Convergence - Portland. Additionally, if you're needing some personal plants feel free to take some! We'll list out our starting plants shortly for swapping, and we'll also have a wish list from the communities we serve. This is a drop-in and out as you please event. And, if you have time to hang we'll have snacks, good people, and some plants we'll need help potting up plus any miscellaneous nursery support. We the Wild Youth is an event to launch a youth empowerment movement to inspire and empower all youth to believe in themselves, have their voices heard, their initiatives supported, and to showcase the supportive resources that already lie within our community. We the Wild Youth is visioned and organized by Francesca Bas, a 17 year old student who has decided to stop accepting the things she cannot change, and start changing the things she can no longer accept. This event is welcoming and open for all youth as a safe space to feel empowered, supported, and have youth voices amplified. △ Performances by local youth musicians through Friends of Noise. We the Wild Youth serves as a gathering place for youth to connect their initiatives through local networks. Over a dozen community partners will be present at the event to show youth the range of support that already lies in our community who believe in them and want to see them succeed. Beyond our event co-hosts Friends of Noise and The City Repair Project, we will have various community organizations that will be tabling on site include Multnomah Youth Commission, Urban Nature Partners PDX, Portland Tennis and Education, Earth Citizens, Life Lines Youth Lines, Q Center, 350PDX, Passion Impact, New Avenues for Youth, Best Buddies, Girls and Boys Club, Earth Guardians, ACLU, Planned Parenthood, Sunrise and more! We are looking to spread the word about this event to as many people as possible! Share the We the Wild Youth Movement to the world! Francesca Bas is a 17 year old student who is passionate about being an activist in community spaces, creating opportunities for all people to feel welcome, supported and empowered. Since June 2018, Francesca has visioned and spearheaded organizing the We the Wild Youth as an event created by youth to empower youth. This year, Francesca has been recognized as one of Oregon’s Mental Health Heroes by Trillium Family Services with the Keep Oregon Well Campaign. Friends of Noise seeks to foster healing and growth for the creative youth in our community via the arts. We host all age concerts that showcase youth first and adult artist second. We teach music production workshops so that young people can host and produce concerts themselves. We teach Music Biz professional development workshops so that young people can have a baseline skill set to navigate the music scene. City Repair is a Portland-based nonprofit that fosters thriving, inclusive and sustainable communities through the creative reclamation of public space. Towards this goal, City Repair hosts a 10-day community building festival called the Village Building Convergence (VBC) that takes place in the beginning of June. Now in it’s 19th year, VBC 2019 will be held from Fri, May 31 to Sun June 9. We are calling for this gathering of Black, Indigenous, and People Of Color (BIPOC) placemakers (artists, musicians, land tenders, community advocates, organizers, etc...) to share tools, resources, strategies and needs for us to thrive in our communities and places, for us to co-create a brave space to talk about the intersections of race and place and how we can leverage our resources collectively to build place-based empowerment. Our first gathering saw folks working in regional policy, intentional community, various art forms, and conveners of community dialogue. Originally intended as a one time gathering, the group felt that meeting with some frequency (right now quarterly), was of interest. Ayomide enjoys creating environments where people can go to the edge of their comfort zone and study themselves. Ayomide believes that Yoga and Art are tools for social justice and community bridging. She is owner of Milieu Gallery. She teaches Kaleidoscope community yoga and a yoga that supports Humans of Color. Before she became the entrepreneur of the arts she Taught dance, DJ events and became a placemaker with City Repair. Ayomide also is co-creator of The Chocolate Laboratory and Chakralot meditation Chocolates. She believes that meditation can be a delicious journey that everyone can experience. Chocolate can be a used as a sweet treat or a tool to support you in investigating your deepest self. Ayomide is a native to Oregon. She has been teaching movement to people of all ages and physical abilities for over a decade. Currently she teaches dance at Portland Community College and Yoga at people's coop and The people's Yoga. Her love for yoga has inspired here to bring yoga to underprivileged youth by offering free yoga in the park for kids and their parents. Join City Repair as we pot up plants and organize our backyard nursery to serve our community sites that have garden sites. The communities we serve transform spaces from parking strips, to removing lawns, to community gardening, to creating food forests. We work with the villages for the houseless to urban farms. If you have spare perennials, please bring them or drop off anytime leading up to this event! Contact kirk@cityrepair.org for more info. This is a rain-or-shine event. Light linch provided! All skill levels welcome! If you're interested in getting involved with City Repair and the Village Building Convergence, this orientation will discuss all the different ways how. Additionally, there'll be supplies to sew lavender satchels while you listen/ask questions. We use the satchels as gifts, so you'll start helping us out from the get-go! A light dinner is provided. Contact kirk@cityrepair.org for more info. Join us for a night of celebration and gratitude through a nourishing dinner, live music, local art, and storytelling! Do you have a broken tool, chair, bench, etc., and want to fix it up? Or are you excited to just help and learn? Inspired by our Community Repair session of the 2018 Urban Permaculture Design Course, this day is designed to help you gain the skills and have access to the tools to fix things, supported by your community! We'll have skilled women and men ready to give you just enough guidance to give it a go and to take advantage of the wood shop at Global Homestead Garage. The day will begin with a 1.5 hour session with permaculture elder, Rick Valley, on tool care, maintenance and use. We're asking for a suggested $20 donation for attending Rick's session so we can financially support this very special offering! Then, starting at 12pm through 3pm, there will be an Open Shop with specialists on hand to help you get oriented and rolling on your project. If you want to fix a garden tool, just bring the broken tool and the replacement part (handle, etc). There will be multiple cordless drills and a wide assortment of shop tools such as table saws and industrial sanders for use, as well as a scrap wood pile to use for some repairs. Please bring your own eye and ear protection. We'll have some on hand but not enough for all. RSVP for the event on Meetup! Each year in January, the Oregon Sustainable Agriculture Land Trust invites the public to attend our Annual Gathering & Site Reports event. This is an opportunity to learn more about the Trust and each of the properties protected by the Trust. Members of each site's stewardship team will give a 10-20 minute slideshow presentation into the last year of site activity and share plans for the future and opportunities to participate. Snacks and hot beverages will be provided. Join us at the Goat Haus - an urban permaculture hub that acts as community home, classroom, VBC placemaking site, and a plant nursery for City Repair to grow plants and gift to the communities we serve. At this event, we'll be doing regular winter garden maintenance, from the pollinator friendly parking strips to the garden beds. All skill levels and ages welcome! A rain or shine event, dress for the weather. Tools and snacks provided. This event is part of a week of celebration of events and service for the the 10th anniversary of the PDX Permaculture Network! PDX SuperVillage Network Potluck and Launch! To cultivate a network of cooperatives and intentional communities is to build community resilience in our city and region. This resilience can look many ways: supporting new and existing cooperatives, improving the ways in which we live together by focusing on the systems that are in place in our houses/communities, increasing our communication between communities, and building interpersonal relationships with folks who share similar lifestyles. For this January gathering, we will first introduce ourselves and the communities we are/have been a part of in Portland. We can then start discussing questions around what SuperVillage interdependence looks like and what our goals are for connecting and forming this network? What needs do the larger community have that we could meet by being connected, aware of, and in touch with each other?" Potluck! Bring a dish or two to share. The house is vegan, but we are totally fine having non-vegan foods in the house. The house has stairs leading up to it, but once inside there is a bathroom on the main floor. We do not have pets. The house is close to many bus lines. We have a bike parking structure at the top of the driveway, and are building a second for the backyard that will hopefully be done by Jan. 18! Street parking for cars is never a problem. This event is part of a week of celebration of events and service for the the 10th anniversary of the PDX Permaculture's 10-Year Anniversary Event Week. Founded on January 15th, 2009, the PDX Permaculture Meet-up Group is celebrating 10 years of events, and one year under the organizational umbrella of the non-profit, The City Repair Project. We're putting together a special week of events, honoring our pot-lucky roots and encouraging more of our members to sign up and come. There's bound to be something here for everyone! Flying DogHeart Farm is a small urban farm located in Portland OR and is a Queer Person of Color (QPOC) and Veteran Owned. The Farm works to join the movement to change the face of farming and herbalism in Oregon and the Pacific Northwest by offering Herbal and Spiritual Support for Humans and Behavioral and Herbals support for Dog Companions. The Farm envisions a diverse community of plant medicine participants - making, growing and building in community where food as medicine is not a novel concept. For this workparty, volunteers will help with general gardening maintenance. Important projects will include moving mulch and pavers. All skill levels and ages welcome! A rain or shine event, dress for the weather. Tools and snacks provided. This event is part of a week of celebration of events and service for the the 10th anniversary of the PDX Permaculture Network. RSVP for the event on Facebook! Permaculture is not a set of new ideas - it is a melding of understanding that comes from many sources - science, our grandparents, Indigenous cultures, observing nature, creative experimentation. The permaculture movement shares technological knowledge about how to live harmoniously with nature/agriculture, but we are continuously challenged by knowing how to come together as humans to effectively and cooperatively implement these solutions in our self care, interpersonal relations, and at the cross-cultural. This event will showcase the work of activists in Portland who draw upon permaculture/Traditional Indigenous Knowledge to bring health and vitality into the social-cultural realm. The brief presentations will share methodologies and opportunities to get involved through discussion where the facilitators bring diverse experiences and techniques to facilitate our deepening awareness and practice of striving for right relationship with the web of life. The event flow will involve small group discussions to activate and connect us right away. More details and event location to be updated soon. Featured facilitators include Letty Chichitonyolotli Martinez (Flying DogHeart Farm and Sacred Lattice Collective School), Madeline Harmon (Peace in Schools and Radical Dharma: Talking Race, Love and Liberation) Barbara Ford (Radical Gratitude), Amanda Rain (Speaking the Unspeakable) Mícheál Steen-Orr (White Men Healing Project) and more to be announced! We know you've been up to something. We know you've got skills. Whether you've retrofitted your whole house with light straw clay or you're a preservation aficionado, this night is all about sharing your learning experience with others. The night will include as many live demos as we can organize, and we'll run concurrently a series of mini-presentations for your intellectual taste buds! Let us know in the question below if you'd like to be considered to do a demo (imagine nixtamal and tortilla making, mushroom log inoculating, bike tune-up 101, (fill in the blank), or to participate in our open space presentations (10 year photo-documentation of food forest, building a pond, greenhouse, fill in the blank). Location is still TBD. Check back soon! PDX Permaculture hosts its first (in a long, long time!) Green Drinks Social Night! The agenda is to not have an agenda. The plan is to enjoy a night out, in celebration of PDX Permaculture turning 10 years old TODAY!!! The Sellwood Public House has a lot of games to make the night even more interesting, including table tennis, darts, shuffleboard, and both permie and non-permie table games. We'll have some door prizes as well. RSVP for the event on Eventbrite! Suggested donation of $9. Nobody turned away for lack of funds. What if we told you all our problems today can be traced back to the dawn of Agriculture? What if we could save the world simply by changing how we grow our food? Food Forestry is a fervent revolution of love, hope, and dedication to growing a healthy resilient future. We can heal our planet and many of the worlds ills all through the resources and societal impacts that food forests provide. Indigenous communities worldwide practice food forestry, and the old growth forests are all but gone as loggers decimate them for the purpose of installing industrial monocrops. We must engage with our landscape and create edible and useful landscapes that nourish our communities. It is a simple and effective powerful act to plant a food forest. Take a world tour of inspiring Permaculture sites on the Planet. We'll visit projects on every inhabited continent and view a wide spectrum of what people have created at different scales and in diverse climates. Andrew's presentation includes many sites not shown in his wildly popular 2016 PDX Permaculture Meet-up presentation. Andrew Millison has been studying, designing, building, and teaching about Permaculture systems since 1996. He is an instructor in the Department of Horticulture at Oregon State University, teaching the Permaculture Design Certificate Course and the Advanced Permaculture Design Practicum. He works with gardeners, developers, university students, and community organizers to promote Permaculture, which he believes is the medicine for Earth’s ailments. Do you see the street intersection paintings around town, benches made of earth, or food forests? This event will explore how communities design and install the projects through the City Repair Project. This is a great event if you want to do such a project in your community or if you want to learn about how to volunteer with City Repair! This date is the application deadline, so this info session is open for any last minute questions and to get help filling out application. Do you see the street intersection paintings around town, benches made of earth, or food forests? This event will explore how communities design and install the projects through the City Repair Project. This is a great event if you want to do such a project in your community or if you want to learn about how to volunteer with City Repair. Big thanks to The Rebuilding Center/Our United Villages for hosting us! If you're interested in cob building, there is an amazing cob installation a part of the warehouse. The Rebuilding Center cob wal and benches. Big thanks to the Planet repair Institute for hosting us! The home and education center is a part of the first City Repair action in 1996 called Share-It Square! As we move into the darkest days of the year, we shall greet it with with mulled wine, a warm hearth and a homemade, holiday market down at the City Repair HQ! Join #CityRepair at the home of a permaculture organizer, Zach, as we pot up starts to share with communities the nonprofit serves. Additionally, we'll be landscaping in parking strips while problem solving how to slow water and potentially create a public compost bin. While we are based in and most of our projects are west of 82nd Ave, we are being asked for help more and more in outer east Portland and Gresham, so we are thankful that Habitat for Humanity Gresham ReStore is hosting our info session to get us out east! City Repair supports many communities designing, installing, and maintaining landscapes from parking strips to food forests using #permaculture principles and ethics. At this workparty, we will be working on a community site acting as a nursery for plants that will be donated out. We will be propagating plants by division and cutting, and supporting soil creation by processing compost on site. Tools and vegan lunch provided! Rain or shine event outside! Vegan super provided. Drop-in as you can, don’t feel pressure to be on time. HOWL 2018 ft. Doc Martin - saQi - El Papachango and much more! DOC MARTIN (LA) - 3 Hr. *Tickets sold SEPARATELY for each night. We offer NO REFUNDS. Lunch provided. Drop in as you can! Join as at the eco/social/music artist collective we call the Goat Haus! 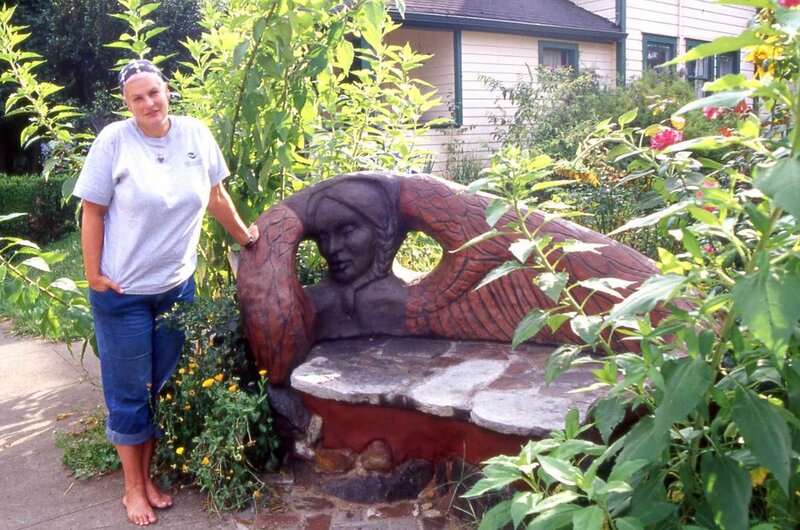 This community has been Placemaking for over two decades using social justice, art and permaculture landscaping both in and out of the[Village Building Convergence](https://villagebuildingconvergence.com/). The Goat Haus also acts as one of our nurseries to propagate and host plants for the communities City Repair serves. In that vein, come out for a volunteer day of helping put their gardens to bed by spot composting, harvesting and perhaps preserving various foods and medicines, plantings like garlic and shallots, transplanting raspberries, sheet mulching and cover cropping demonstration, Freebox repair and extension and of course hanging out with our beloved goats Callie, Kimmie and Dora. All are welcome at the Village Coalition's General Assembly meetings, where we gather to discuss resources, service opportunities, values and vision, and partnerships. If you've not been to Hazelnut Grove before it's easy to access as follows: park at or near Overlook Park (across Interstate from the Kaiser Interstate campus) and walk down the hill on Interstate to the intersection with Greeley, then take a right on the bike path until you see the gate in the fence.